Attached is a screenshot of procedural terrain/world I and a co-worker have been working on. There's no clever terrain LOD schemes, just a brute force method of throwing loads of triangles at the HW (the terrain is ~100,000 triangles, of which 25% are rendered in any given frame). The cool thing is that everything is procedural. The terrain, terrain/detail/mask textures, clouds, trees, tree impostors, flocking birds, etc, are all procedural. It's a <200k .exe file that doesn't load any artwork. We still have some work to do on it, but will be releasing the whole thing with source as part of a webcast training on developing procedural content for 3D applications. (Uh oh. Here comes the plug). Real-time Procedural 3D Graphics on the PC, or "How to Send the World through a 56k Modem", with Kim Pallister & Dean Macri. Learn how to use the horsepower of the processor to generate 3D content algorithmicaly, saving valuable artist time & download bandwidth. 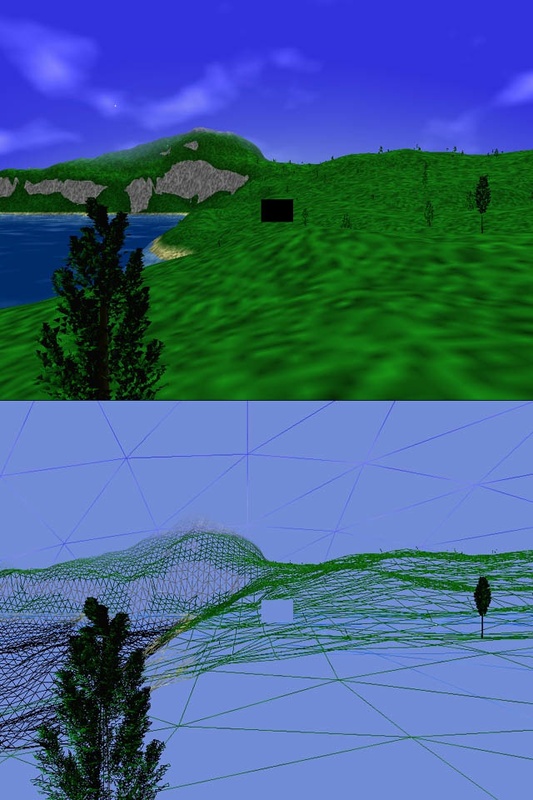 Understand procedural generation of terrain geometry, textures, trees, clouds and more. We'll discuss and demonstrate performance implications and experiments we've tried in DirectX*. This session should interest persons familiar with 3D graphics programming and/or Microsoft DirectX. These webcasts will feature slides, live audio streaming, demos, and a chat window where you can meet with peers and ask questions of the presenters. To register, see http://developer.intel.com/software/idap/training/ under "Spotlighted Courses". A couple archived webcasts on scalable 3D apps & cloth animation are already up there.